DAKAR, Senegal — Airmen from the Kentucky Air National Guard’s 123rd Contingency Response Group transferred control of a humanitarian cargo hub to replacement forces Nov. 18, successfully completing their support of an Ebola-response mission that has processed more than 750 tons of relief supplies for airlift into Liberia. 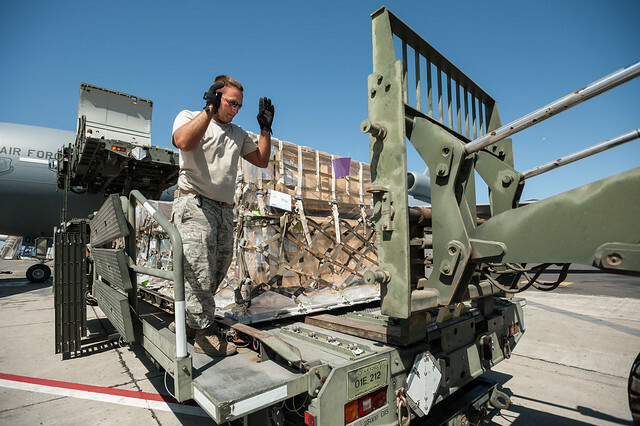 While the Kentucky unit’s role is winding down as its members prepare to redeploy to the United States, the humanitarian cargo operation will continue at Léopold Sédar Senghor International Airport under the direction of the new troops — more than 70 Airmen assigned to the 787th Air Expeditionary Squadron. Lt. Col. Michael Brock, commander of the 787th, expressed his gratitude to the men and women of the Kentucky Air Guard for their “outstanding stewardship” of the aerial port from its inception. Mounkes said he was proud of his forces, which include more than 70 Air Guardsmen from Louisville, Kentucky, and seven active-duty Airmen from Travis Air Force Base, California, and Joint Base Maguire-Dix-Lakehurst, New Jersey. Those Airmen arrived in Senegal Oct. 4 to find a bare-base facility consisting of little more than two empty buildings and a vacant lot situated next to an airport taxiway. 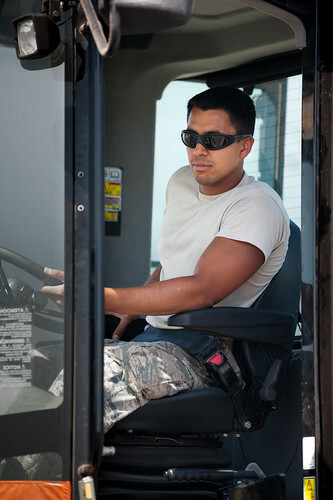 From that, the Airmen built a fully operational aerial port in less than 24 hours, supplying their own satellite-based voice and data communications, electric power generation, airfield command-and-control capability, all-terrain forklifts, specialized cargo-handling equipment and aircraft maintenance assets. That cargo, which arrived in Senegal aboard civilian 747s and U.S. Air Force C-17 and KC-10 cargo aircraft, included items like tents, latex gloves, human blood, stretchers, electric generators, and food and water. Airmen from the 123rd worked around-the-clock to offload cargo as it arrived, prioritize it for forward movement, and upload it to U.S. Air Force C-130s for final delivery in Liberia. Click here for more photos from the 123rd’s mission. 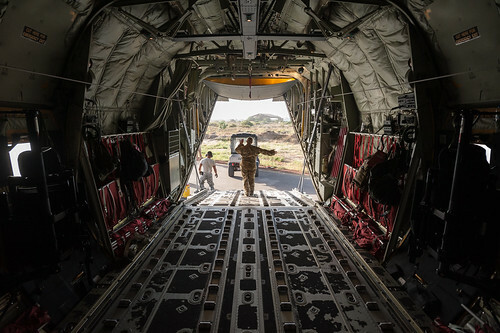 Since beginning operations in Senegal, the Kentucky Airmen have coordinated the movements of 188 in-bound and out-bound aircraft, processed 809 passengers for airlift and handled 754.9 tons of cargo, Mounkes said. “The U.S Government’s response to this outbreak is a massive commitment of resources from multiple federal agencies, all under the direction of the U.S. Agency for International Development,” Mounkes noted. “The Department of Defense alone has committed to deploying nearly 4,000 forces to build multiple Ebola treatment facilities in Liberia, staff medical laboratories and train local health-care workers. Mounkes also expressed his appreciation to the people and government of Senegal for their support throughout the deployment. “The Senegalese Military and the High Airport Authority continue to be essential partners in this effort, and their contributions have been fundamental to the success of the mission in every way,” he said. For many of the deployed Kentucky Air Guardsmen, Operation United Assistance has been one of the high points of their careers. Master Sgt. Charles Wilding agreed. “I think the entire CRG has done astounding things here,” said Wilding, non-commissioned officer in charge of aerial port operations. “Working with all the different entities, including the U.S. Army and the Defense Logistics Agency, has been a real pleasure. Everyone put forth maximum effort, and we all came together like a big family to deliver a lot of support downrange.